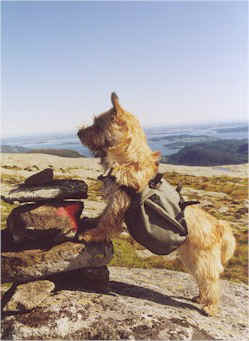 I have had an eye for Terriers for a long time, and in 1987 we got our first Cairn Terrier; Kjekri's Mariette. She was a lovely dog, and the interest for this breed was established. There were not many Cairns in Norway at the time; therefore I got in touch with breeders in Great Britain. My first connection was Sally Ogle, Kennel Pinetop. She got me in touch with Mrs. Judy Parker-Tucker, Kennel Uniquecottage. I was fortunate enough to buy a very nice young male dog; N Uch Uniquecottage Ben Aslak . Ben, who has a very strong male dog line in his pedigree, also had one res.CC in England when he came to Norway. 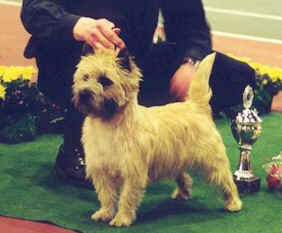 A few years later, I imported , N Uch Uniquecottage Gold Rust and Uniquecottage Sparrow Lark litter brother and sister. These two dogs are out of one of Mrs. Parker-Tucker's best females; GB Ch Uniquecottage Swallow Lark. The three imports from the UK all have produced champion puppies. Worth mentioning is the fact that out of a litter of four, sired by Ben Aslak, two of the dogs are Norwegian Champions and group winners. The mother is N Uch Reigab’s Tara. The two "puppies" are N Uch Reigab’s Zorro (also Top Cairn Terrier 1999), and N Uch Reigab’s Zina. Ben has also sired a champion in England. 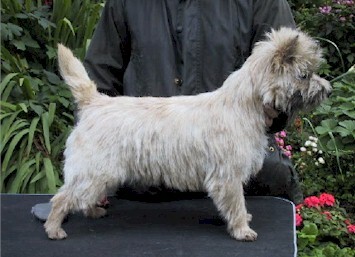 Our latest import from Kennel Uniquecottage is Uniquecottage Honey Boy (Magnus). He has only been shown a few times in Norway, winning res.CCs. Magnus has been an excellent stud-dog in our kennel, and has sired three of our young and promising Cairns. 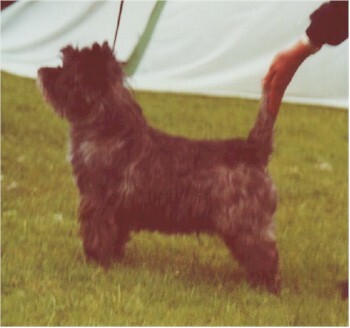 We have dogs with three different Uniquecottage lines, and these are in our opinion, as well as Mrs. Parker-Tucker's, some of the best ones from this very successful breeder. We also have a male dog from Kennel Hjohoo's in Sweden; Hjohoo’s Great Pleasures For Hjo (Niklas). Niklas, who we own in partnership with Gerd Flatebø, is by Nord Ch WW98 Hjohoo's Hjo Got The Right Stuff. Our last import from England is Cloverbrook Count On Me (Ebbie), from Mrs. Sue Braybrook's Cloverbrook Kennel. Ebbie has only been shown one time in Norway, and she has got one CC.